Northern Public Radio's history began in 1954, when WNIU signed on the air at 10 watts. Broadcasting only a few hours each day, programming included announcements of campus events, lectures and music. In 1964, transmitting power was increased to 2,500 watts, allowing WNIU to serve DeKalb, Sycamore, and most of the rest of DeKalb County in Illinois. Programming evolved as well, to focus more on music and local news and less on campus information. In 1971 WNIU became a charter member of National Public Radio, and a tradition of bringing the best in national and international news to northern Illinois began. NPR's first major program was All Things Considered, and the network made an early name for itself by providing live coverage of the Watergate hearings. 1974 brought a significant increase in service, as the station received authority to raise its power to 50,000 watts. Classical music and jazz were programming staples, along with NPR's All Things Considered. The power increase also brought WNIU's unique programming to listeners in Rockford for the first time, although reception was spotty at best. A second service was added in 1979, as the Northern Illinois Radio Information Service (NIRIS) signed on the air. NIRIS provides the reading of daily newspapers, magazines, books and other materials for people with print impairments. NIRIS is staffed primarily by volunteers who give their time and efforts to providing this important service. In 1988, WNIU moved its transmitting tower to a site near Lindenwood, Illinois. This move provided significantly better reception to listeners in the Rockford area, and immediately provided an opportunity for more people to hear public radio's unique programming. Other changes were in process at the time, and they came to fruition in 1991. WNIJ signed on the air that year, and the programming previously provided by WNIU was split into two distinct services. WNIU became an all-classical music station, and WNIJ provided news, jazz and entertainment. That same year, two new facilities were opened. The NIU Broadcast Center, 801 North First Street in DeKalb, is a 17,000 square foot facility housing WNIJ and WNIU. It provided expanded studio space, reception areas, and offices. Riverfront Museum Park, 711 North Main Street in Rockford, now houses much of the NIRIS operation along with auxiliary studio and office space. In 1998 a significant commitment was made to news and information, as WNIJ became a news-talk station. Jazz was still played each evening. In addition, the stations "swapped frequencies," with WNIU moving to 90.5 and WNIJ to 89.5. This allowed more people to hear the NPR news programming that is the heart of Northern Public Radio's service. In 1995, Northern Public Radio received a grant from the US Department of Commerce to build "repeater" stations in LaSalle, Sterling, and Freeport. These stations were placed in these particular communities because they were previously unserved by public radio. While some listeners were able to hear WNIU, WNIJ, or stations in other locations, most were not. Northern Public Radio officially became a "network" in 1998, when WNIW in LaSalle and WNIQ in Sterling signed on the air. They were followed by WNIE in Freeport in 1999, bringing the Northern Public Radio network to five stations. Today, Northern Public Radio looks forward to new ventures that will provide even more service to listeners. This website has helpful links to National Public Radio news and a search engine called Radio Scout that allows internet searches by subject for news stories produced by public radio organizations around the country. The future will bring more forays into cyberspace. National Public Radio will soon provide programming direct to listeners via satellite. Northern Public Radio will continue to look for opportunities to provide true public service to listeners in our broadcast area. Thanks for listening! 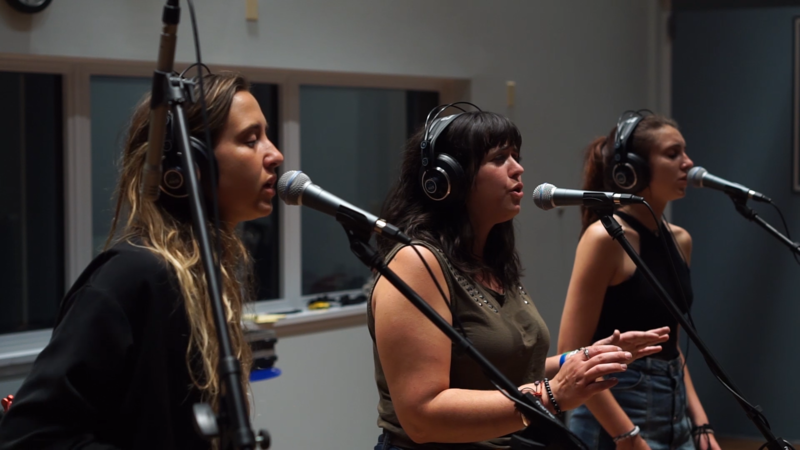 Sessions From Studio A is a program dedicated to showcasing regional and touring musicians, featuring performances recorded in WNIJ's own Studio A. The Lone Canary, an acoustic duo from Rockford, stops by Studio A to talk about their latest album release, and perform original songs.